Whoever thought a novel idea could be transformed into a multi-million dollar business venture in less than half a decade? Well, to one Dhiraj C Rajam, that’s a possibility because it’s exactly how he started his now world-famous Mu Sigma business analytics company. The name of the company derives from the Greek letters ‘μ’ and ‘σ’ which are used for the abbreviation of the mean and standard deviation in statistics. Dhitaj founded the company in 2004, in the United States, when he was just 30 years old. Previously he worked as a consultant in PricewaterhouseCoopers and Booz Allen Hamilton. In 2008, the company received its first round of funding of $30 million, from FTV Capital. The company mainly provides marketing analytics services that help businesses make decisions based on well researched statistical data. 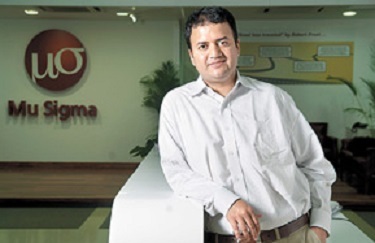 Dhiraj Rajaram – a picture from the site of the company – mu-sigma.com. According to Mr. Dhiraj, finding people with all of these skills was not that easy, especially for his then grassroots venture. But once the company started attracting customers and the right personnel, his journey to the entrepreneurial summit hasn’t taken a break, and he is yet to find his comfort zone. Today Mu Sigma has around 3 500 employees and around $250 million in revenue. Some investors value the private company as much as $7 billion. Today, the founder of the business Dhiraj C Rajam is 39 and owns a 49% stake in the company. To read cool startup stories like this one, don’t miss checking out some of our suggestions below. If you liked this story, please share it, this will help our site produce more cool stories like this. Thanks.